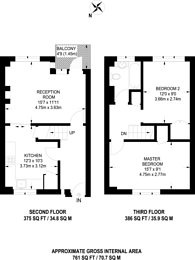 This wonderful two bedroom duplex flat offers a spacious reception room with ample space to dine and a private balcony, and also benefits a sizeable kitchen, good storage space and two well proportioned double bedrooms. The property is ideally situated near a superb selection of shops and amenities including the nearby Stratford Westfield shopping centre. The closest transport links include Forest Gate and Wanstead Park Stations.